I don't know why I stopped. Maybe it was the way the light fell on a leaf. But there are so many leaves round here. So many brambles. Non-stop brambles really. They are a backdrop to everything. Well, I don't know. That's just how it was. I stopped. And having stopped. I saw. And the result? This. It isn't exactly a stuck foot post - but nearly. One branch. A few old leaves. A few old leaves and . . . and next year's new ones. Here they are. Or, rather, here are a few hints. Every leaf is different. At this time of year the differences are even greater than at others. Their histories are longer and it shows. Their neighbours have gone, many of them; so their individuality is more easily seen. It was Christmas Eve. I don't know why we like the idea of snow at Christmas. If there's meant to be snow at Christmas, fine. But here . . . it would be an oddity. Snow is a treat and if there is any it won't be till later. Christmas is a time for odd glimpses and blue skies and bright colours which leap out in cold moments. Quite a lot of gloom - then red or yellow. Thorns! And in among the thorns - next year. 2015. More about Stuck Foot Posts. 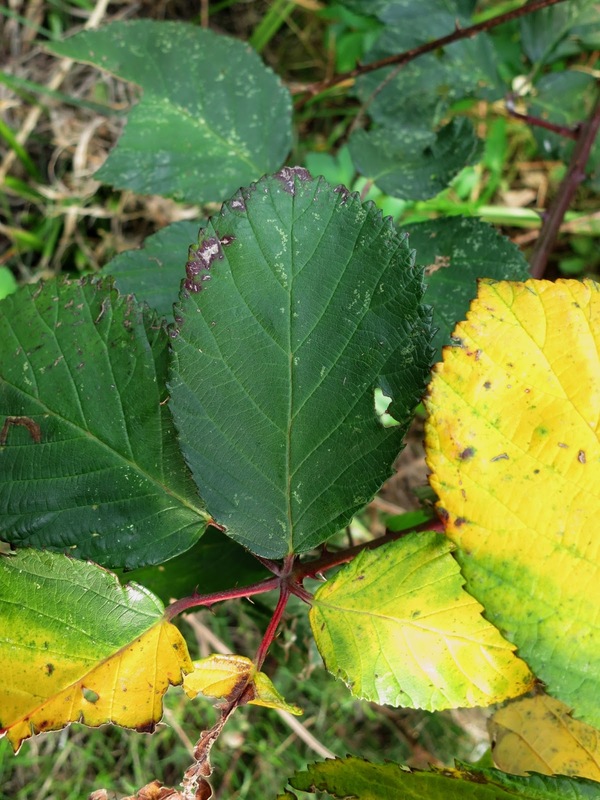 All photos in this post are of the same bramble (blackberry) branch. They were all taken within a few minutes of each other on the afternoon of Christmas Eve 2014. I started pruning my, now nearly leafless, blackberry bush recently and there were already plenty of signs of new growth. Morning, Laura. 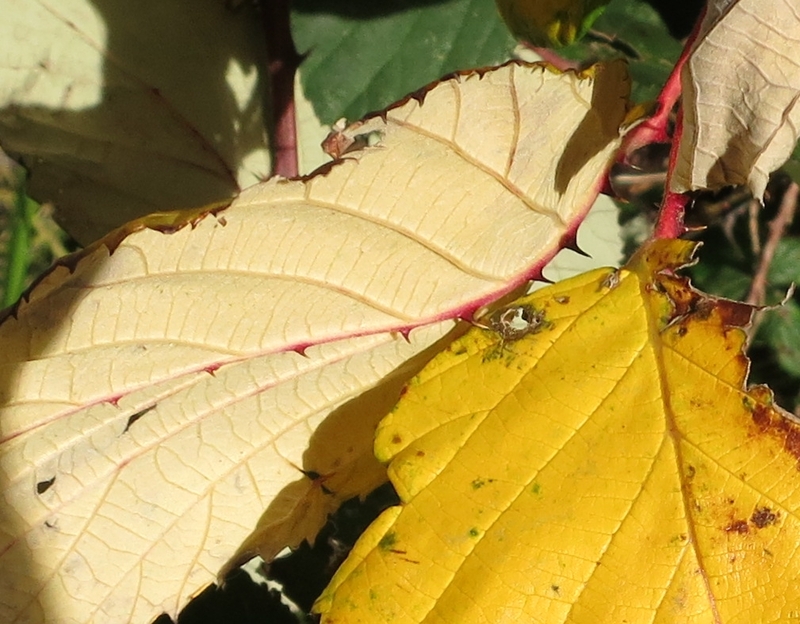 We are both noticing yellow! It's so bright and cheering - along with the new shoots. Hello Mike. 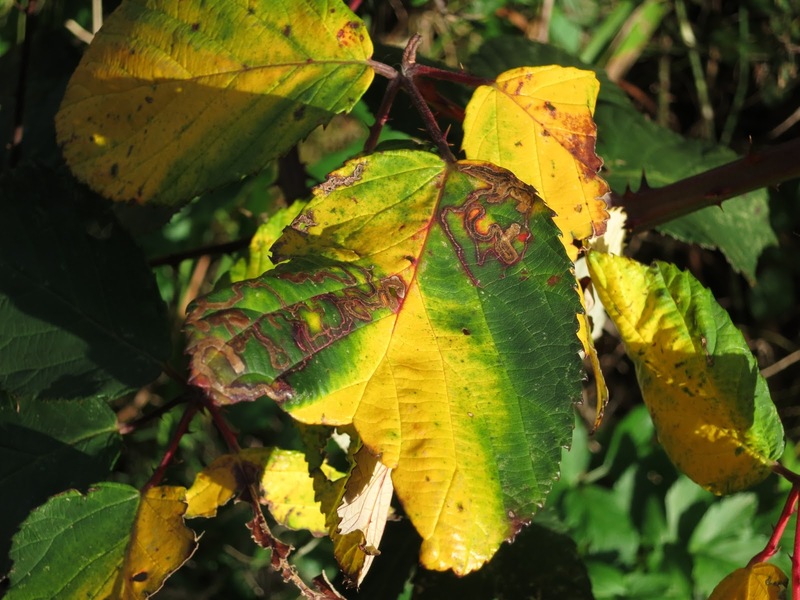 I think it was with blackcurrant (rather than with blackberry) bushes that I first noticed how woody plants get ready early for the next season. Blackcurrants and a sycamore next to a railway bridge. After that a horse-chestnut. Once one notices . . . how ever could I have ever missed this is what happens for so much of my life?! There are still quite a few leaves on bushes around my garden, although covered in the remnants of snow that we received a couple of days ago (a white Boxing Day instead of a white Christmas!). 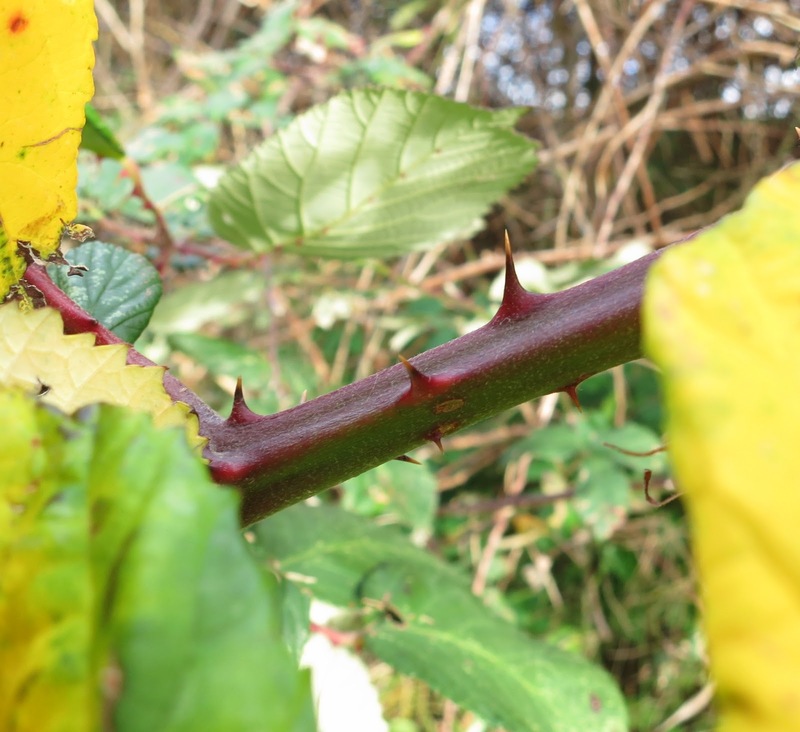 Careful of those thorns!! Hello Rosie. I expect there will be snow pictures on your blog some time - unlikely to have any here but if we do . . . I'll make the most of it! Hello Elaine. I think I remember seeing donkeys eating holly. Would your bramble-eating goats go that far? Lucy I love the idea of next year's growth between the thorns...I will have a Stuck Foot or you in January...Happy New Year. Brambles here are bare, I had a walk along the river yesterday and no signs of life. My first time visiting your blog Lucy - I must have a wee nosey around! Happy 2015 Lucy, thank you for letting me play along with the tree following. I started late (in April) so still have a few months left to do before I do a whole year. What wonderful photos Lucy!! You have made the humble bramble look amazing! 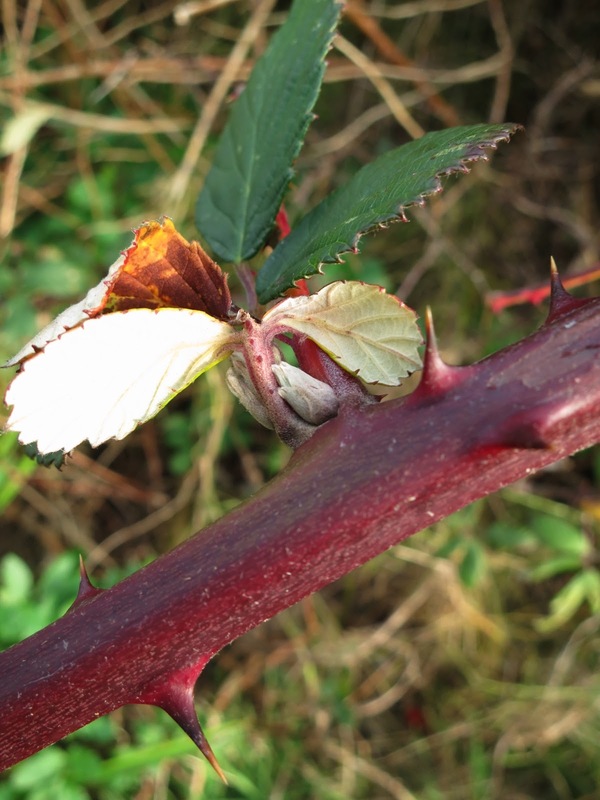 In actual fact it does have lovely colouring and I love the deep red stems and thorns, they look even better in a photo as there is less risk of getting painfully caught up in them! You might be interested in linking into my monthly neme 5 in 5. This is where I invite you to take as many photos in 5 minutes and to post 5 of them. Exactly what you have done here! The link is open from 5th to 25th of each month. I will certainly be looking for a tree to follow and using this as a theme for one of my future posts.